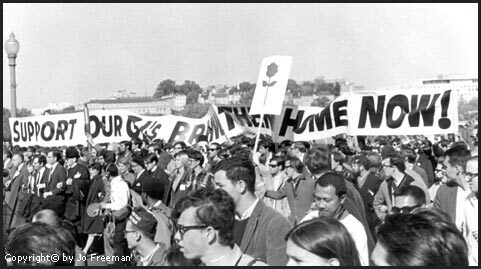 The so-called "March On The Pentagon" drew nearly 100,000 protestors of The War in Viet Nam. The group first assembled peacefully in front of the Lincoln Monument before making their way to the Pentagon. Spokesperson Dr. Benjamin Spock publicly referred to President Lydnon Johnson as “the enemy” and Allen Ginsberg enticed the crowd to collectively chant to see if they could levitate The Pentagon. (Gee, I wonder why none of these types of protests were ever successful or taken seriously???) I'm sure it all made sense at the time … depending on whatever you had ingested that day. 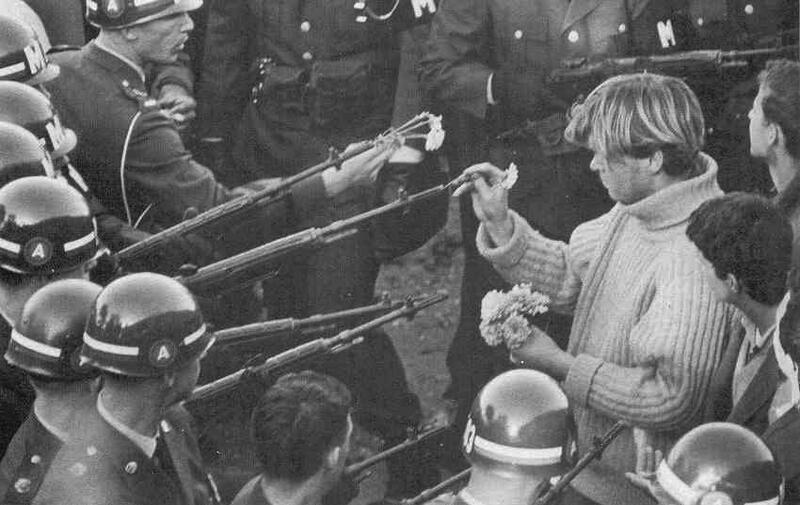 There were incidents along the way that caused military personnel to hold the protestors at bay once they reached their ultimate destination, but by the time the rally finally broke up (the early morning hours of October 23rd), a total of only 683 people (including novelist Norman Mailer) had been arrested … not bad for a crowd of this size. 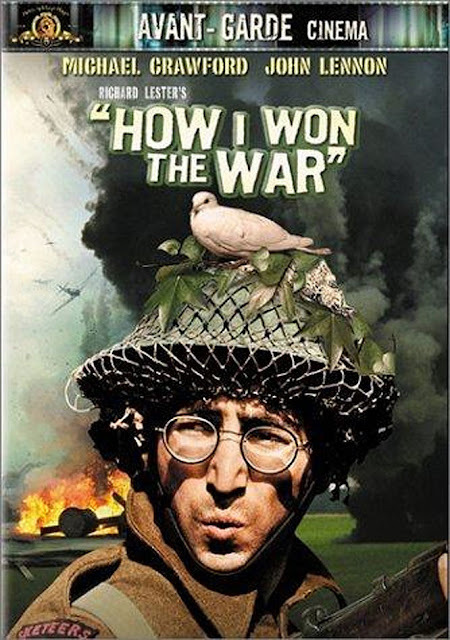 On the upswing (with a move of ten positions or more) are "Even The Bad Times Are Good" by The Tremeloes (#53 to #42), "Everlasting Love" by Robert Knight (#60 to #43), "I Can See For Miles" by The Who (up 25 places from #71 to #46), "King Midas In Reverse" by The Hollies (#58 to #47), "Pata Pata" by Miriam Makeba (up 32 places from #80 to #48 … I just love the feel of this record), "Kentucky Woman" by Neil Diamond (which climbs 34 spots from #84 to #50), "Rock 'n' Roll Woman" by Buffalo Springfield (#65 to #51), "Beg, Borrow And Steal" by The Ohio Express (#69 to #56), "Big Boss Man" by Elvis Presley (#91 to #57), which places it just a couple spots ahead of its B-Side "You Don't Own Me" (#86 to #59), "Shout Bamalama" by Mickey Murray (#76 to #58), "Lazy Day" by Spanky and Our Gang (#89 to #60, a jump of 29 spots), "Hush" by Billy Joe Royal (#85 to #70), "If This Is Love" by The Precisions (#83 to #71), "Boogaloo Down Broadway" by The Fantastic Johnny C (#90 to #73), "What've I Done To Make You Mad" by Linda Jones (#95 to #75) and "Give Everybody Some" by The Bar-Kays (#99 to #80). In Meridian, Mississippi, seven men (including a sheriff’s deputy and a Ku Klux Klan leader) were convicted of violating the civil rights of three civil rights workers. A couple of '60's classics also premier on the chart this week … "I Heard It Through The Grapevine" by Gladys Knight and the Pips debuts at #82 (it'll be an even bigger hit next year when Marvin Gaye records it) and "I Say A Little Prayer", another Hal David - Burt Bacharach gem, premiers at #86 for Dionne Warwick. (It, too, will be a hit again next year when Aretha Franklin puts her soulful spin on this one.) I also liked Jay and the Techniques' follow-up single to their big Top Five Hit "Apples, Peaches, Pumpkin Pie", "Keep The Ball Rollin'", which premiers at #90 this week. Jose Feliciano records his unique version of "Light My Fire". It will peak at #3 next year. The Beatles added vocals to “Hello, Hello”, a track they started nearly three weeks earlier. 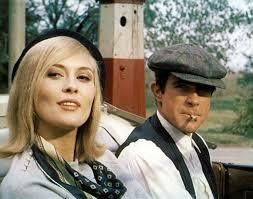 When completed, it will be retitled “Hello, Goodbye” and become their next #1 Record. 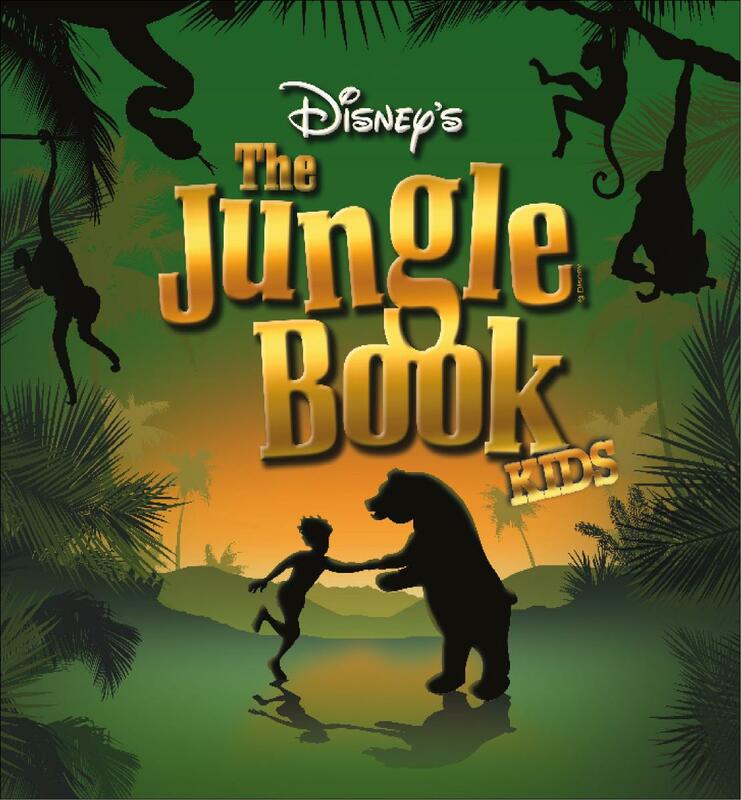 Walt Disney Studio's 19th full-length animated film, "The Jungle Book," is released today. It is the last full-length animated motion picture that founder Walt Disney was personally involved with. 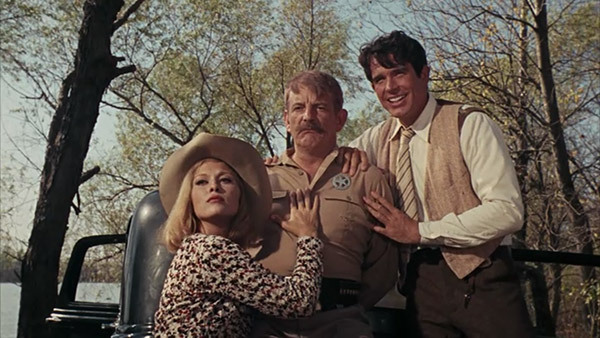 (He died the previous December) It features the voices of Phil Harris, Sterling Holloway, Louis Prima and Sebastian Cabot and goes on to be a huge critical and box office success and will top the motion picture box office for a total of six weeks in the weeks to come. 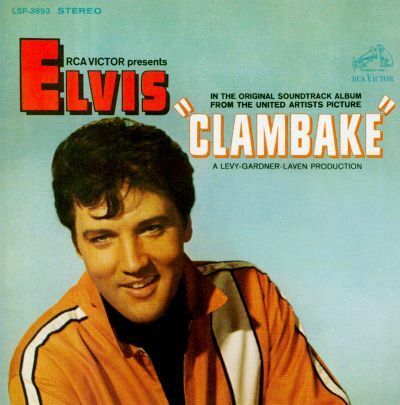 Elvis Presley's 25th movie, "Clambake", opens in theaters today. Some serious revamping was done before the production moved to The Biltmore Theater on Broadway in April of the following year, where it then ran for 1873 performances. How popular was the music from this musical? 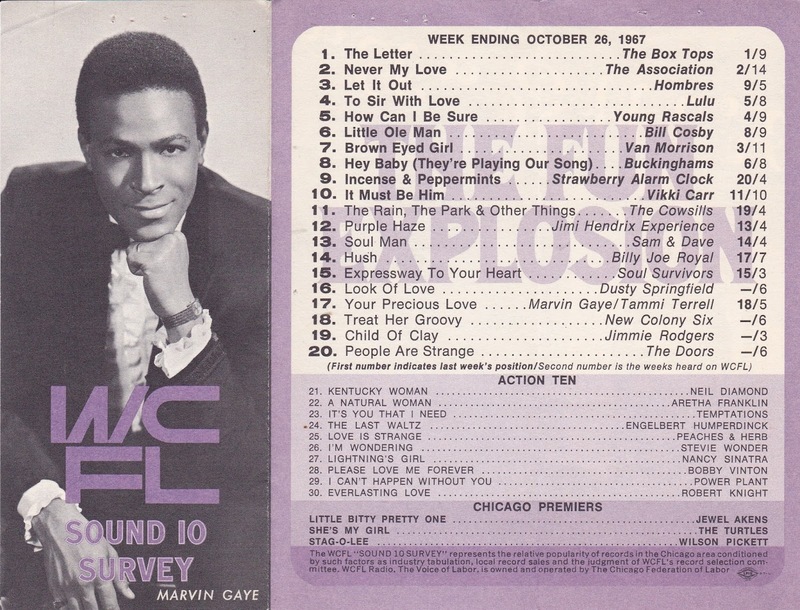 Four different Top Three Smashes by a Who's Who of Recording Artists were released from its soundtrack, including MAJOR hits by The Fifth Dimension ("Aquarius / Let The Sunshine In"), Oliver ("Good Morning Starshine"), Three Dog Night ("Easy To Be Hard") and The Cowsills ("Hair") … although ALL of those hits would come in 1969 after the musical reached mass appeal on Broadway. 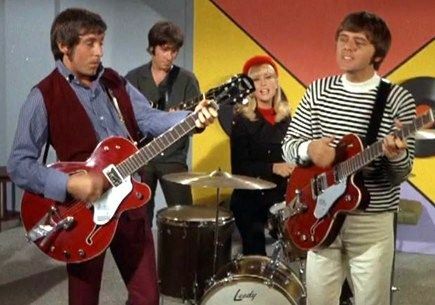 Tommy Boyce and Bobby Hart (along with Record Producer Phil Spector) appear on this week's episode of "I Dream Of Jeannie". The Doors performed at Danbury High School in Danbury, CT.
Bob Dylan begins recording his next album at Columbia Records’ Studio A in Nashville, TN. 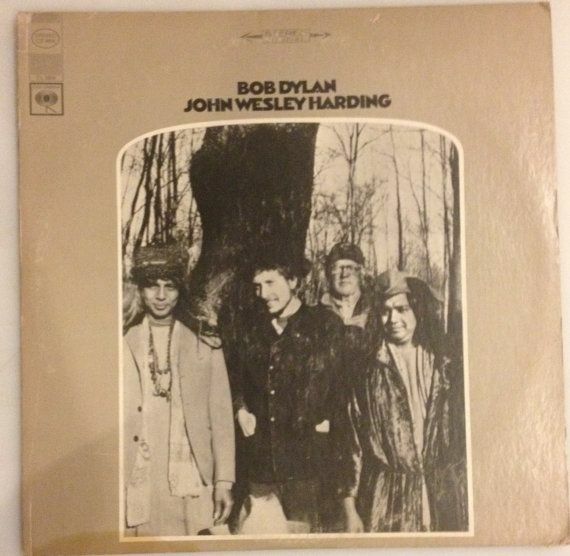 The album will be completed six weeks later on November 29th and released as “John Wesley Harding”. As expected, Lulu takes over the #1 spot on the chart this week with her movie theme hit "To Sir With Love". "The Letter" by The Box Tops and "Never My Love" by The Association each fall a spot to numbers 2 and 3 respectively. 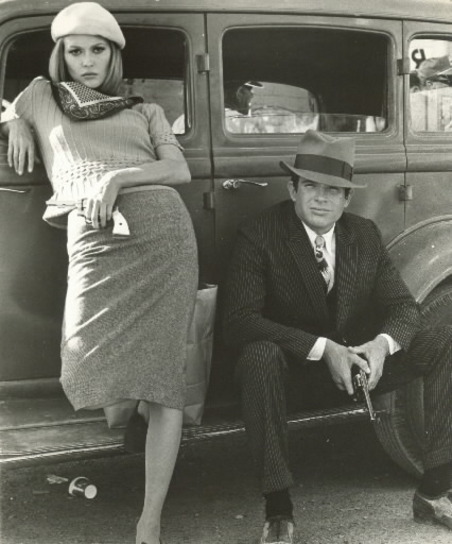 Meanwhile, "How Can I Be Sure" by The Young Rascals continues its climb, moving from #6 to #4 this week. "Soul Man" by Sam and Dave enters The Top Ten, climbing from #14 to #6, as does "Hey Baby, They're Playing Our Song" by The Buckinghams (#12 to #8), "Your Precious Love" by Marvin Gaye and Tammi Terrell (#17 to #9) and "Expressway To Your Heart" by The Soul Survivors (#15 to #10). 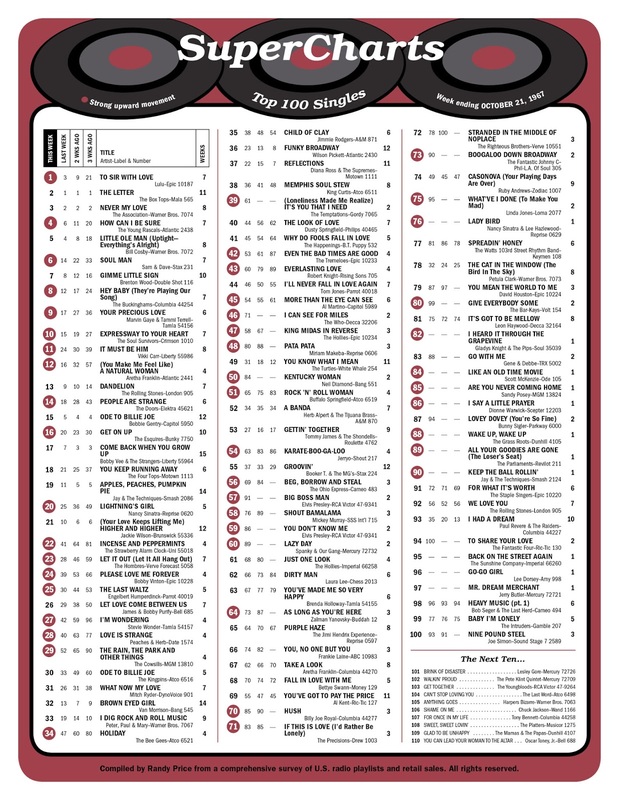 "It Must Be Him" by Vikki Carr continues its rise up the ranks, moving from #24 to #11 this week, a jump of 13 positions. 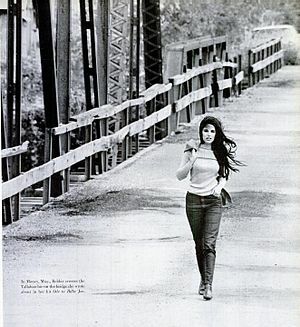 "A Natural Woman" by Aretha Franklin is up from #16 to #12, "People Are Strange" by The Doors climbs from #18 to #14, "Get On Up" by The Esquires moves up four spots from #20 to #16 and "Lightning's Girl" by Nancy Sinatra cracks The Top Twenty, moving from #25 to #20 this week. Other big movers within The Top 40: "Incense And Peppermints" by The Strawberry Alarm Clock (#41 to #22), "Let It Out" by The Hombres (#28 to #23), "Please Love Me Forever" by Bobby Vinton (#39 to #24), "The Last Waltz" by Engelbert Humperdinck (#30 to #25), "I'm Wondering" by Stevie Wonder (#42 to #27), "Love Is Strange" by Peaches and Herb (#40 to #28), "The Rain, The Park And Other Things" by The Cowsills (#52 to #29), "Holiday" by The Bee Gees (#47 to #34) and last week's top debut, "It's You That I Need" by The Temptations, climbs from #61 to #39. "Ode To Billie Joe" holds on to the #1 spot on the album chart. 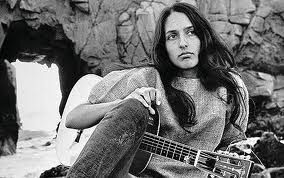 55 people, including singer / activist Joan Baez (and her mother! ), are arrested in Oakland, California, and sentenced to ten days in jail for blocking the entrance to the city's armed forces military induction center in protest of the draft. 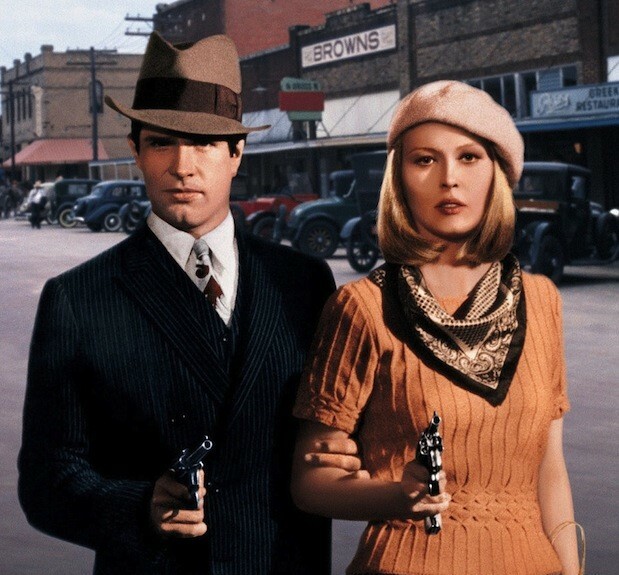 "Bonnie And Clyde" spends its final week at number one at the box office, giving them eight weeks on top overall … more than any other film this year. It seems to be a shoo-in for the Academy Awards next year. Simon and Garfunkel perform on The Smothers Brothers Comedy Hour. The Lovin' Spoonful appear on The Ed Sullivan Show tonight and perform "She's Still A Mystery" and "Only Pretty".